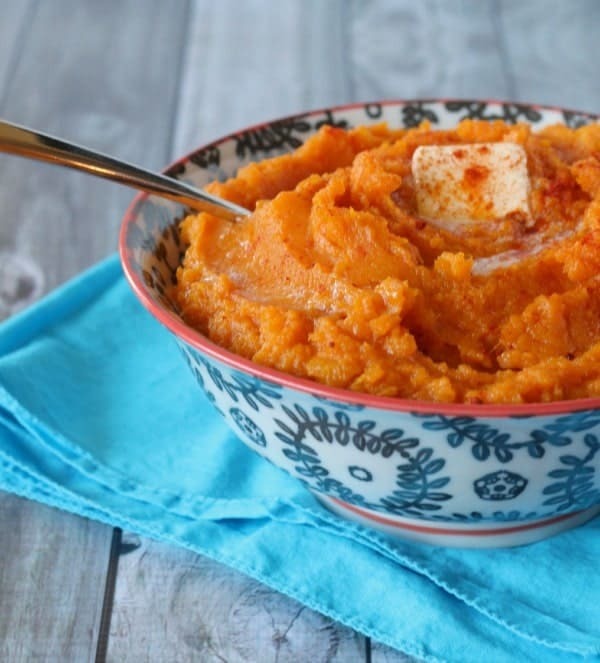 Smoked paprika makes this butternut squash mash recipe a real stand-out. Perfect for your Thanksgiving table or as a healthy side dish any day of the week. I’ve always loved butternut squash. Despite my disdain for peeling it, it remains one of my favorite vegetables. And once my mom told me “your vegetable peeler is horrible,” and bought me a new one, the task of peeling the squash suddenly became a lot less tedious. Go figure! It’s funny when you’re used to something being so crappy that when you move to something that is functional it is like a miracle. A dream come true. 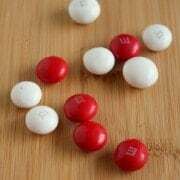 A life saver! Yes, I am this excited about a vegetable peeler. How beautiful would that butternut squash look on your Thanksgiving table? I can’t get over how gorgeous it is. I added a nice little chunk o’butter but you could easily make this as healthy as you want. The butternut squash is naturally very creamy. You could even make this a vegan side dish by omitting the butter and using vegetable broth instead of milk. Me, I’ll stick with butter. But even without butter, you still get tons of great flavor from the smoked paprika. You could even add a little more. Sometimes I’m a little iffy on smoked paprika so I always play it on the conservative side. You can always add more to taste, but you can’t remove it once it is in there! But you could add more butter. So there’s that. Preheat oven to 350 degrees Fahrenheit. Line a baking sheet with foil. Rub squash halves with oil and sprinkle with spices and salt. Place flesh side down on the baking sheet. Roast for 45 minutes to one hour or until tender. Once cool enough to handle, scoop out flesh and put in a large bowl. 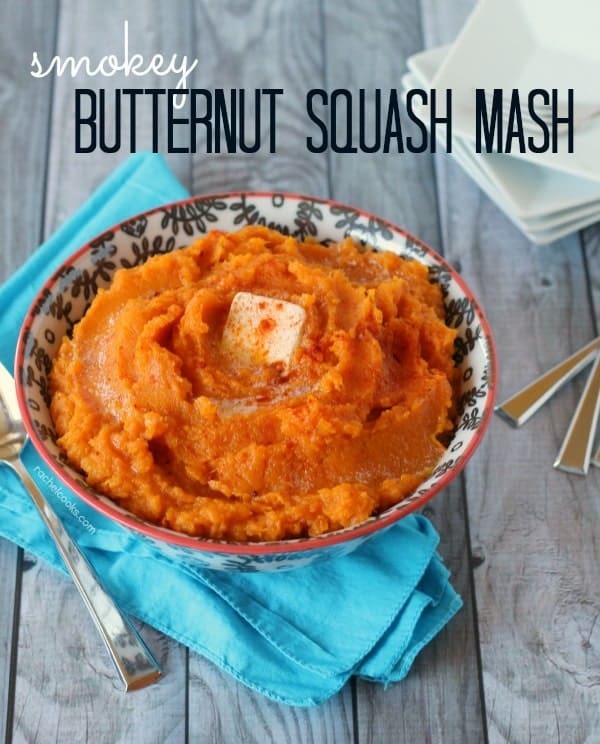 Add butter and milk and use a potato masher to mash the squash until you achieve your desired consistency. You may use a hand mixer or an immersion blender if you prefer a smoother mash. I like a little texture in mine. Verdict: E and I loved this butternut squash mash. Ben wasn’t wild about it. He ate it but prefers it with brown sugar and cinnamon. Can’t say I blame him – brown sugar and cinnamon are always a good decision. Craving more butternut squash? 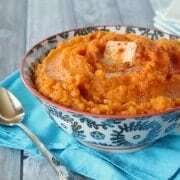 Try my Quinoa, Bacon and Kale Stuffed Butternut Squash, Moroccan Slow Cooker Chicken, my Spicy Sweet Roasted Butternut Squash or this great soup! 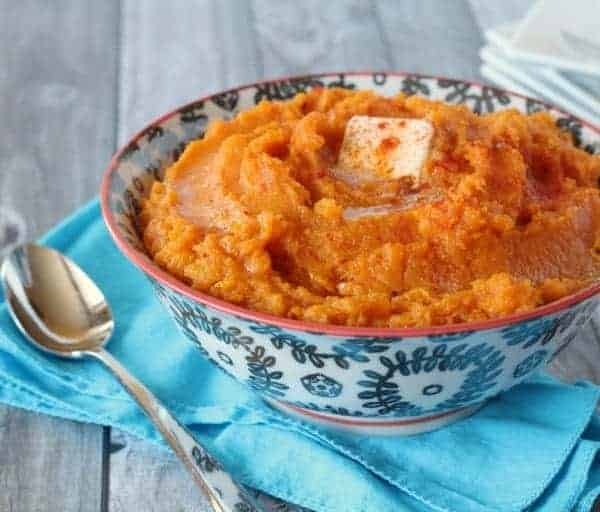 Updated: I shared a recipe explaining how to make butternut squash in the slow cooker which would eliminate the need to even use a peeler! We make this sometimes and it always tastes sooo good! Haha, my mom used to give me such a hard time about my terrible cutting boards. So random, but of course she was right at the end of the day :) Anyway, I love butternut squash, it’s the best! 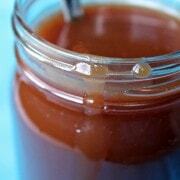 I usually do mine super sweet with brown sugar but I’ve gotta try this! I’ve used sweet paprika in mine before but never smoky. I love that idea! Butternut squash is one of my faves! Love the smoked paprika! Adding the smoke element to this is just genius! Oh yum!! 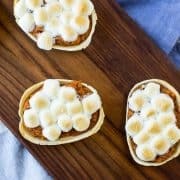 I always go the sweet route with my butternut squash, but I’m thinking that I need to try a little smokiness! This sounds so good. Totally agree with you on smoked paprika! Just enough and it’s perfect, but sometimes too much can be over the top. You should try the Kuhn peelers, they are great too, and only like 4 dollars. Makes the best stuffing stocker.